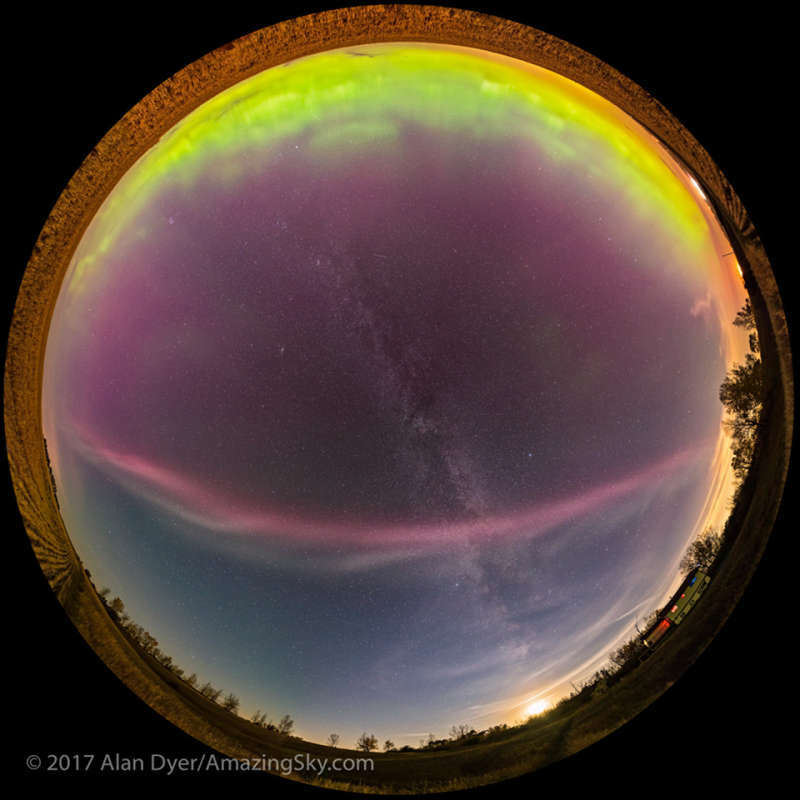 Explanation: Familiar green and red tinted auroral emission floods the sky along the northern (top) horizon in this fish-eye panorama projection from September 27. On the mild, clear evening the Milky Way tracks through the zenith of a southern Alberta sky and ends where the six-day-old Moon sets in the southwest. The odd, isolated, pink and whitish arc across the south has come to be known as Steve. The name was given to the phenomenon by the Alberta Aurora Chasers Facebook group who had recorded appearances of the aurora-like feature. Sometimes mistakenly identified as a proton aurora or proton arc, the mysterious Steve arcs seem associated with aurorae but appear closer to the equator than the auroral curtains. Widely documented by citizen scientists and recently directly explored by a Swarm mission satellite, Steve arcs have been measured as thermal emission from flowing gas rather than emission excited by energetic electrons. Even though a reverse-engineered acronym that fits the originally friendly name is Sudden Thermal Emission from Velocity Enhancement, his origin is still mysterious.